11:40am 8/28 Update: The updated round of predictions is not great – upwards of 30kcfs just downstream of us which is double what we’d want to see. These forecasts also include any rain forecasted in the next 24 hours and we’re predicted to get a 2″ storm. If this storm goes south or is less than expected that should help bring down forecast levels substantially. Either way, we will know definitely by tomorrow (Wednesday) evening about official trip cancellations. This one is gonna get us. Last night, central Wisconsin just got a repeat of last weeks flood producing storms with areas receiving up to 11″ of rain. This was the exact same storm setup that knocked out the Middletone/Cross Plains/Mazomanie area except this time a lot of the rain occurred in the Wisconsin River watershed. Expect to see the Kickapoo River downstream of us at or near record flood levels. While it’s a little too early to know exactly how bad it will be on our stretch of river, it will almost certainly be right to the limit of sandbar availability. 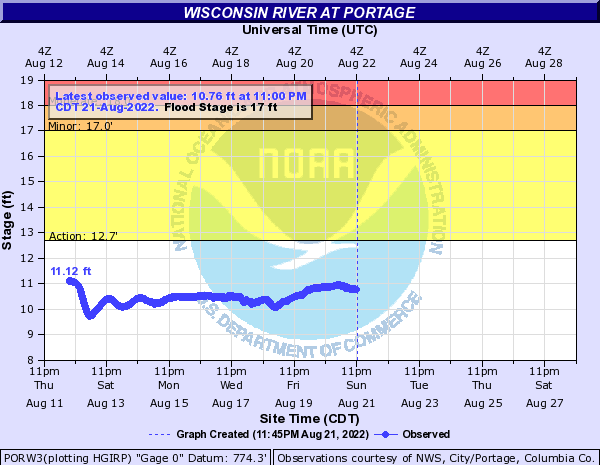 There is currently a wall of water making its way downstream which will hit us over the next 24 hours or so. From there, flood predictions issued at 3:40am currently have water levels high enough to shutdown trips from this Thursday to Sunday. Because this is preliminary data and such a drastic change (5kcfs to 20kcfs) in only a couple days these predictions will be refined as the week progresses so don’t be too quick to cancel any river trips you have planned. Luckily water levels have been at or below normal levels for the last month so we’ve got room to absorb quite a bit of this which should allow for a quick recovery. The higher waters also appear to be limited to Castle Rock about 48 hours upstream of us which will means it’ll clear out fast. Watch the graph below for the most recent predictions (usually twice a day) – we’re aiming to be below 13.5′ in order to have sandbars available to camp on. We’ll continue to issue updates as the picture becomes more clear.